Using advanced NMR spectroscopy methods to guide materials design. Most people associate NMR with magnetic resonance imaging (MRI), which is used as a diagnostic tool in medicine. Nuclear magnetic resonance probes the nuclei of atoms as they absorb and re-emit radio waves when they are placed in a magnetic field. Those nuclei resonate at measurable radio-frequencies that precisely depend on the local structure of material, the element being studied, and the strength of the magnetic field. The research is further discussed in the paper, Enhancing Magnetic Functionality with Scandium: Breaking Stereotypes in the Design of Rare Earth Materials, authored by Yaroslav Mudryk, Durga Paudyal, Jing Liu, and Vitalij K. Pecharsky; and published in the Chemistry of Materials. Despite a surge in solar cell R&D in recent years involving emerging materials such as organics and perovskites, the solar cell industry continues to favor inorganic crystalline silicon photovoltaics. While thin-film solar cells offer several advantages—including lower manufacturing costs—long-term stability of crystalline silicon solar cells, which are typically thicker, tips the scale in their favor, according to Rana Biswas, a senior scientist at Ames Laboratory, who has been studying solar cell materials and architectures for two decades. Thin-film solar cells typically fabricated from semiconductor materials such as amorphous silicon are only a micron thick. While this makes them less expensive to manufacture than crystalline silicon solar cells, which are around 180 microns thick, it also makes them less efficient—12 to 14 percent energy conversion, versus nearly 25 percent for silicon solar cells (which translates into 15-21 percent for large area panels, depending on the size). This is because if the wavelength of incoming light is longer than the solar cell is thick, the light won’t be absorbed. This challenge prompted Biswas and colleagues at Ames to look for ways to improve ultra-thin silicon cell architectures and efficiencies. In a paper published in Nanomaterials, they describe their efforts to develop a highly absorbing ultra-thin crystalline silicon solar cell architecture with enhanced light trapping capabilities. “We were able to design a solar cell with a very thin amount of silicon that could still provide high performance, almost as high performance as the thick silicon being used today,” Biswas said. Proposed crystalline silicon solar cell architecture developed by Ames Laboratory researchers Prathap Pathi, Akshit Peer and Rana Biswas. The key lies in the wavelength of light that is trapped and the nanocone arrays used to trap it. Their proposed solar architecture comprises thin flat spacer titanium dioxide layers on the front and rear surfaces of silicon, nanocone gratings on both sides with optimized pitch and height and rear cones surrounded by a metallic reflector made of silver. They then set up a scattering matrix code to simulate light passing through the different layers and study how the light is reflected and transmitted at different wavelengths by each layer. In addition to the cell’s unique architecture, the simulations the researchers ran on NERSC’s Edison system utilized “homegrown” code developed at Ames to model the light via the cell’s electric and magnetic fields—a “classical physics approach,” Biswas noted. This allowed them to test multiple wavelengths to determine which was most optimum for light trapping. To optimize the absorption of light by the crystalline silicon based upon the wavelength, the team sent light waves of different wavelengths into a designed solar cell and then calculated the absorption of light in that solar cell’s architecture. 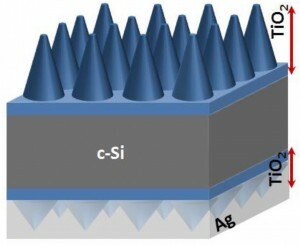 The Ames researchers had previously studied the trapping of light in other thin film solar cells made of organic and amorphous silicon in previous studies. Looking ahead, given that this research is focused on crystalline silicon solar cells, this new design could make its way into the commercial sector in the not-too-distant future—although manufacturing scalability could pose some initial challenges, Biswas noted. Much of the quest for novel materials has moved into science labs. The search is more efficient than when Albertus Magnus (allegedly) synthesized the Philosopher’s Stone, but the game is still intelligent serendipity. We try combinations of ingredients, combinations of heating, mixing and other processes, and hope that one of them works. During the last few decades, a scaled-up, highly organized and automated search system called “combinatorial chemistry” has produced new drugs and materials including automotive coatings, hydrogen storage materials, materials for solar cells, metal alloys and organic dyes. Let’s consider one (very nice) example: DNA. With current technology, DNA is much more easily manipulated than other materials; during the past few decades, we have developed many ways to manipulate DNA molecules. In 1980, Nadrian Seeman looked at M.C. Escher’s “Depth,” an infinite regular array of fish, and decided to make it – which he ultimately did, three decades later. In between, he made a cube of DNA; Paul Rothemunde made a DNA smiley face, Leonard Adleman showed how DNA can compute things and a whole community arose making nano-things out of DNA. The Sensitive Instrument Facility (SIF), still awaiting its first occupants, can’t be disturbed. Really. And that’s what makes it a great place for researchers to make some minuscule discoveries. I might say that the SIF is still in its shakedown phase, but that would be wrong. Nothing shakes the SIF. The SIF at ISU’s Applied Science Complex, northwest of campus. The $9.9 million facility, built with federal money, will house microscopes and instruments scientists will use to examine and manipulate materials at the atomic level. When they’re dealing with something so small, even the slightest vibration can knock their views wildly askew. Some apparatuses are so sensitive the operators must sit in a different room: even their heartbeats and breathing could send off ruinous vibrations. In this post, I’ll tell you how the SIF shelters these delicate devices. In a future post, I’ll cover the instruments and what they do. The Ames Laboratory, a Department of Energy facility ISU operates on contract, specializes in materials science. Their scientists (who often hold joint appointments as ISU faculty) create and test compounds for use in myriad applications, from new solders to high-tech magnets and more. That means understanding – and building – these materials from the atoms up. Microscope images line the hall that separates SIF offices from the control rooms, bays and service corridor. The SIF, designed by Sears Gerbo Architecture of Tucson, Arizona, will house an arsenal of new and existing equipment to support that task. Most use electron beams to probe how atoms are arranged in materials, so the microscopes also must be shielded from the barrage of electromagnetic activity that bombards us from power lines, radio and cellphone signals and more. Even dust is an issue; a mote is a mountain at the atomic scale. So when it formally opens in 2016, workers arriving at the SIF will change into shoes they only use there. Visitors will don booties like those surgeons wear in operating rooms, says Matt Kramer, director of the lab’s Materials Science and Engineering Division and my host on the tour. Siting the SIF was tricky, Kramer says. Consultants considered several spots, but railroads, an industry that brought Ames to prominence, are a problem. A major east-west route carries several trains through the city each day. And moving away from the rails isn’t always a solution: A plot at the ISU Research Park south of the campus was ruled out as too near to traffic on U.S. Highway 30. The SIF service corridor, sited on a separate slab from the rest of the building. Ultimately, engineers chose land at ISU’s Applied Science Complex, already home to several research facilities. Although its access road crosses a railroad, tests found the site had the lowest vibration levels in the consultants’ experience – when a train isn’t passing, Kramer noted. And while the tracks seem close, they’re even closer at the north edge of campus, another location the lab considered. To insulate the instruments from rumbling wheels and other shaking, designers incorporated an array of defenses, starting with the SIF’s siting: Its length is perpendicular to the railroad. When vibrations come from the tracks to the south, the building “is like a ship, breaking the waves” to deflect them, Kramer said. Below, footings are angled for stability and the foundation is a two-foot slab of concrete sandwiching at least one layer of a spring-like material. Walls and ceilings also are concrete, but none of it contains steel reinforcing rods: Engineers replaced them with non-ferrous materials like fiberglass to minimize electromagnetic conduction. The SIF is sliced lengthwise into five sections. The westernmost finger, on the back side, is a service corridor housing mechanical equipment, like heating and air conditioning and chillers to cool the instruments. The corridor is on a separate slab from the instrument rooms to avoid transmitting vibration and noise to them. A SIF control room: not a place for claustrophobes. The finger along the building’s opposite edge, along the floor-to-ceiling windows on the east side, houses offices, a conference room and two labs (wet and dry) where technicians will prepare material samples for examination. A hallway, lined with cool microscope images gathered in a campus contest, is the second finger, running the length of the building and separating the offices from the parts where the real work happens. Just off the hall are control rooms. In most cases, technicians will sit here, remotely operating the sensitive microscopes in the equipment bays just beyond them to the west. This isn’t like a control room for a hospital MRI, with windows looking onto the machines. “There’s actually nothing to see” and no patient to monitor, Kramer said. A copper grounding strip reduces charge disparities between the instrument bay and the control room. Copper chains hang from lab chairs to ground them. The instrument bays comprise the fourth (from east to west) of the five fingers. There are six, including an unfinished, double-width space on the south end to house multiple instruments. “It was just as easy to make the building oversized” in anticipation of future new equipment, Kramer said. He’s already fielding researchers’ requests to locate instruments in the vacant spots. The walls of some bays are lined with quarter-inch aluminum plating to block external electromagnetic signals. Electrical conduits and the hardware holding everything together also are non-conducting to avoid transmitting or creating electromagnetic interference. Kramer in the SIF’s unfinished double-width bay, designed to hold at least two instruments. There’s even a twist to the wiring – literally. Moving electrons create magnetic fields, so technicians installing the electric cables spiraled them to concentrate those fields and limit the interference they may cause. Instrument bay doors must remain closed at all times to maintain a constant temperature; a high-tech thermostat tracks even tiny changes and quickly corrects them. Heating and cooling is specially designed to silently circulate air on the perimeter of the room, avoiding drafts directly on the microscopes. The SIF is an indication that Ames Lab’s status in the DOE laboratory system is rising. It’s a minor player, overshadowed by giants like Argonne National Laboratory near Chicago and Tennessee’s Oak Ridge National Laboratory, but with DOE locating its Critical Materials Institute at Ames in 2013 and the SIF opening in 2016, Ames Lab is getting some attention. With the new facility and its devices, “We’ll be able to do a lot of the state of the art (materials) characterization that only a few other facilities” around the country have, Kramer says. “It’s going to be a big boon” for the lab and ISU.